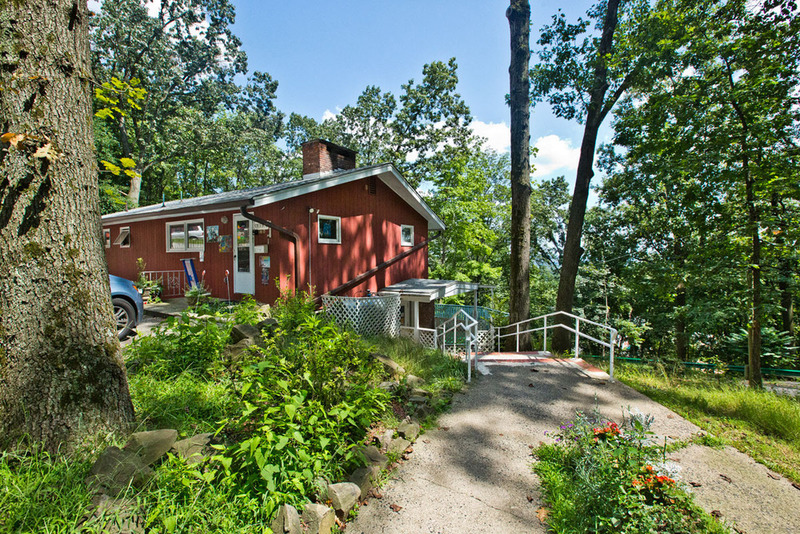 Set high up on the hill among the trees, Jin-A's unique campus allows for children to play, create, and explore in a natural setting. Our school gives children the opportunity to connect with and experience nature first hand, from the many different plants and trees, to the deer and rabbits that often show up on campus. Even the wildlife love it here! Our large playground has plenty of room to play and explore. 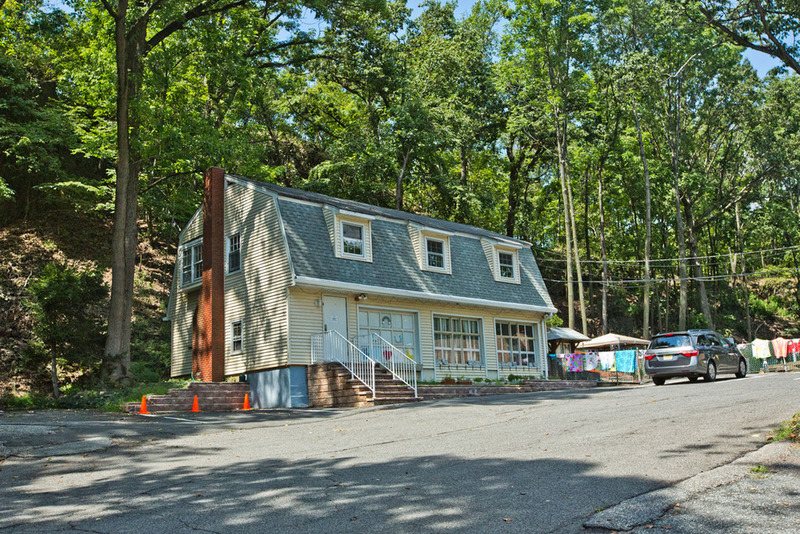 Two Pre-school classrooms occupy the "brown house," one of three main buildings on the campus. 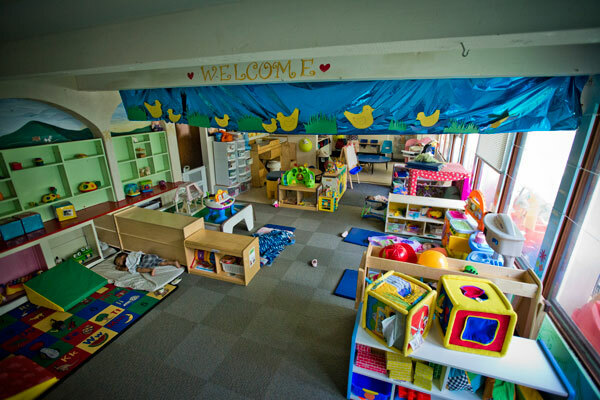 Our Young Child Program occupies two classrooms on the first floor, with the Kindergarten using the top floor. A look inside the Toddler room. Along with the play stations and learning areas, there is a full kitchen for snack and meal times. 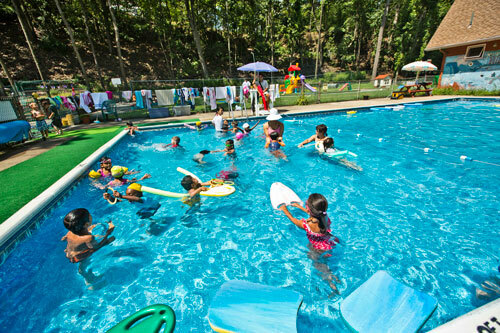 provides a cool escape during our Summer Program! 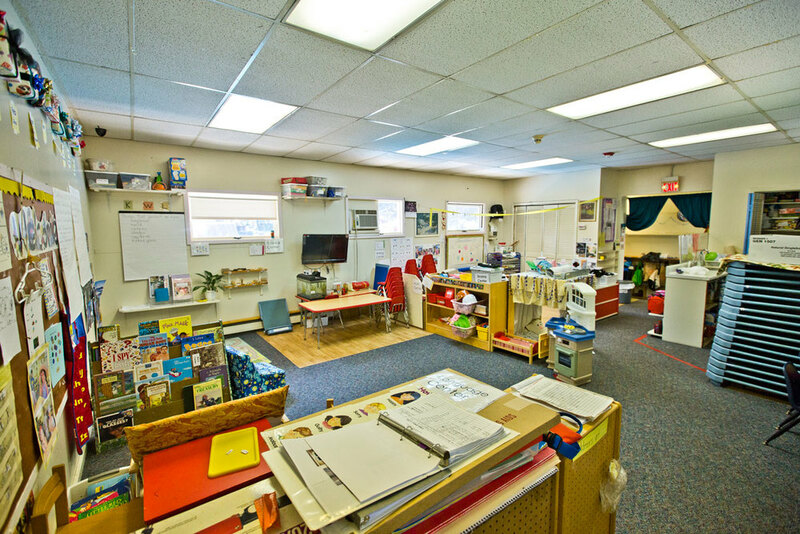 Main offices, Toddler Room, and newly built all-purpose room for special events and indoor play. Labyrinths are often used for quiet contemplation and mediation. 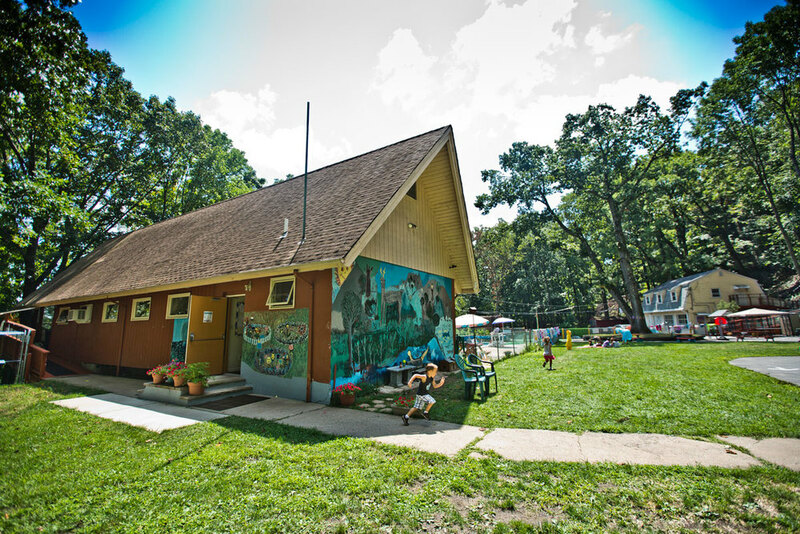 For the children, it is a unique space to enjoy nature and engage with their senses. 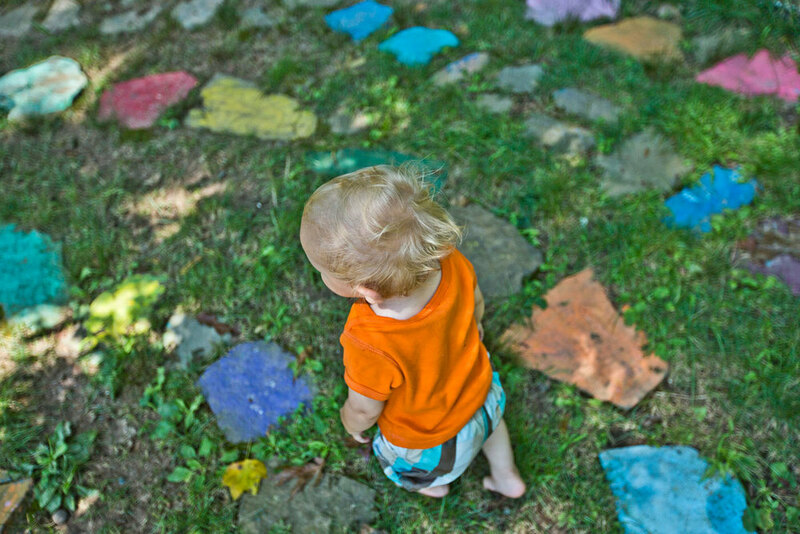 A quiet space with colored stepping stones where children can go to unwind. As they walk along the path, under the shade of the trees, they can hear the birds singing, see the butterflies passing, and feel the breeze on their faces. The teachers use it too, to help transition the children from outside play to indoor time. It’s a small space but you can touch the dirt and taste a variety of fresh food. The children enjoy helping to plant seedlings. They also get some extra individualized attention because the small space only allows a few at a time. As the vegetables ripen, the children eat the produce straight from the garden (after washing) or the teachers use it for snacks and cooking projects. We also compost! We use our large all-purpose room for gross motor play when the weather does not allow outdoor play. We provide an hour of physical education each week in this room. It is used for events like parents or teachers workshops and graduation ceremonies. Parents have also rented the All-Purpose Room for their children’s birthday parties. Our facilities are monitored by a security system for the safety of students, staff and families. Cameras in the premises help us to monitor staff and students, and the main gates and buildings require access with a Key Fob that is given to parents and guardians upon enrollment. Keeping our classrooms clean is a top priority in providing a safe and healthy environment. We contract with the trusted professionals at Ultra Pure to provide a multi-phase cleaning and sanitizing process in our facilities on a regular basis. Our classrooms are also equipped with high quality air filtration systems to further reduce the spread of illnesses and eliminate allergens. Along with using recycling for art projects, Jin-A also encourages parents to send in their one-sided used office paper for children to use for doodling. 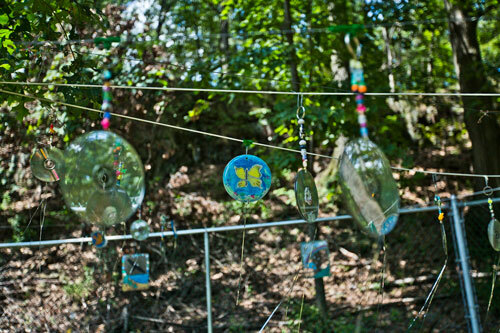 With the plastic water bottles and soda bottles brought in by parents, Jin-A has created a fence garden. We cut up boxes into different shapes for the children to use for collage. Anything not recycled at the school gets taken to the recycling center. meet with our staff and see the place for yourself!